I saw this recipe over on Joelen’s blog and knew it was something I wanted to try. It was simple to make and so tasty. The sauce is amazing and I love the addition of pesto. I would have like to make my own pesto but didn’t have fresh basil on hand and had a jar of prepared pesto…there’s always next time! Pat chicken dry with paper towels and season with salt and pepper. Heat 1 tablespoon of oil in a large skillet over medium high heat just until smoking. Cook chicken until golden brown, approximately 3 minutes on each side. Once browned, transfer chicken to a plate and tent with foil. Add remaining oil to skillet and cook mushrooms until browned about 5 minutes. Stir in garlic and cook until fragrant about 30 seconds. Add cream, broth and chicken to skillet scraping up any browned bits and bring to a boil. Reduce heat to low. Cover and simmer for about 15 minutes ot until chicken is cooked through about 15 minutes. Transfer chicken to serving platter and tent with foil. Return skillet to high heat and simmer until sauce is thickenen about 5 minutes. Once sauce is thick, remove from heat and stir in pesto and lemon juice and season with salt and pepper. 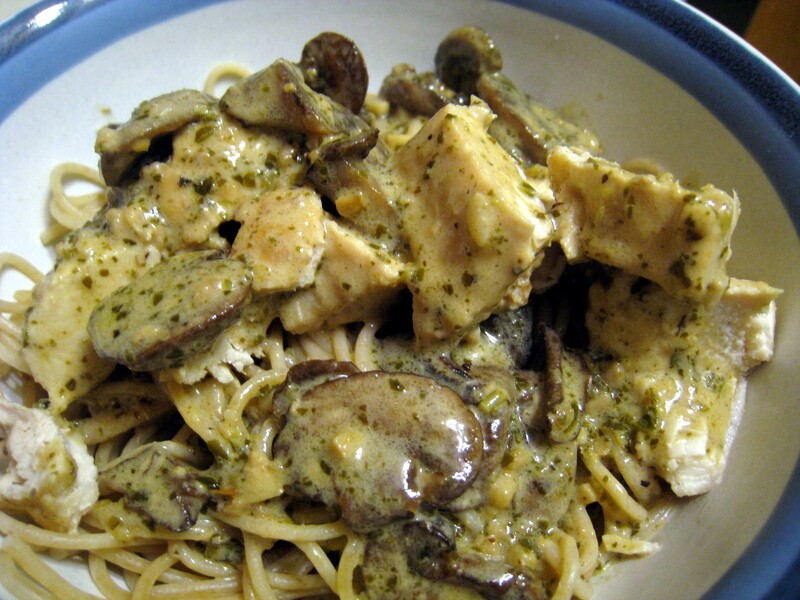 Serve over spaghetti with the sauce on the side or over chicken.